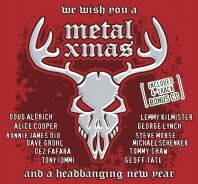 We Wish You A Metal Xmas And A Headbanging New Year Special Edition 2CD Released September 21! We Wish You A Metal Xmas is a headbanging holiday treat, with hard rock and heavy metal-charged versions of your favorite joyful tunes. This revved up 2010 version is completed with four new tracks from the companion EP released in 2009. The late great Ronnie James Dio, Lemmy Kilmister, Alice Cooper, Billy F Gibbons (ZZ Top), Geoff Tate (Queensryche), and Dave Grohl (Foo Fighters, Them Crooked Vultures), in addition to many others, crank out some fierce and festive merriment on classics like “Run Rudolph Run,” “God Rest Ye Merry Gentlemen,” and “Silver Bells.” The four bonus tracks include “O Christmas Tree,” featuring Doro Pesch and Michael Schenker, “Auld Lang Syne,” performed by Girlschool, “Frosty The Snowman,” featuring Steve “Lips” Kudlow (Anvil) and “Rudolph the Red Nosed Reindeer,” featuring Dez Fafara (DevilDriver) and Doug Aldrich (Whitesnake). Deck the halls with boughs of rocking!